This bolognese sauce came into my life during the summer of 2002 while I was living in New York City for an internship at YM magazine. Every day after work, I walked from my office on the edge of Madison Square Park to my brother’s apartment on East 22nd for dinner. Most suppers were uneventful and consisted of boxed macaroni and cheese, or something equally processed and convenient. Sometimes though, when the heat wasn’t too overbearing in his apartment, my brother whipped up something extra special for us to eat. Spaghetti bolognese was a rare treat from that sticky summer in the city. My brother learned how to prepare this sauce from his friend Anastasia. The secret to its fragrant profile and unique flavor is whole cloves and cinnamon sticks. While it might seem strange mingling warm spices with pork, beef, and tomatoes, it works beyond beautifully in this situation. Two hours of slow and low simmering on the stove top marries all of the flavors together, creating a thick, hearty, and complex brew. One bite and it’ll be obvious that this ain’t your average meat sauce. 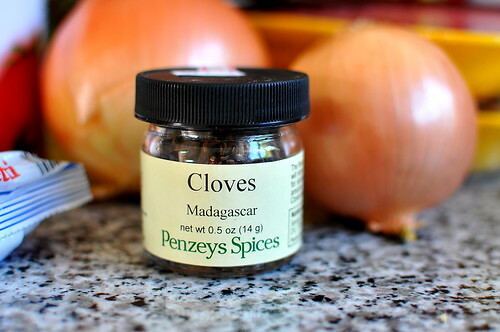 Whole cloves are the secret to this sauce’s success. Make sure to fish them out to avoid crunchy bits of bitterness. Same with the cinnamon sticks. Pour 1 tablespoon of olive oil into a large, heavy-bottomed pot over medium-high heat. 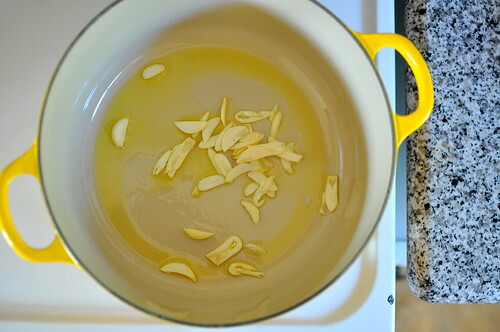 Add in sliced garlic and cook until its edges are golden, about three minutes. 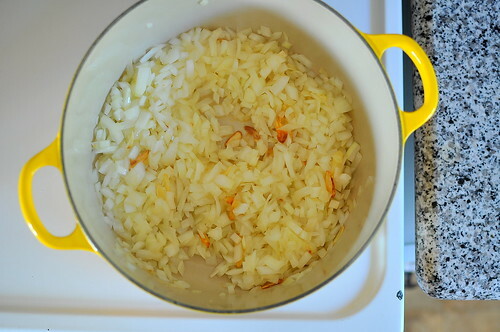 Next, add the chopped onions into the pot and saute until slightly softened and translucent, about five minutes. Season with salt while sauteing, approximately 1/2 teaspoon. Add beef and pork, and increase the heat to high. 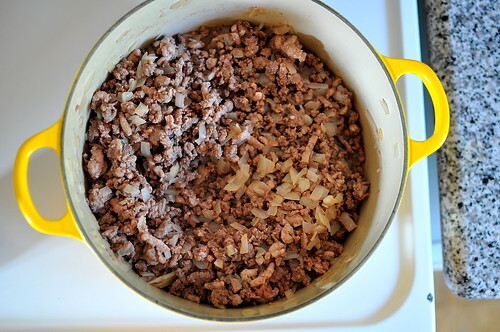 Cook until the meat is brown, breaking into small pieces with the back of a spoon, about 15 minutes. Season with additional salt, approximately 1/2 teaspoon. 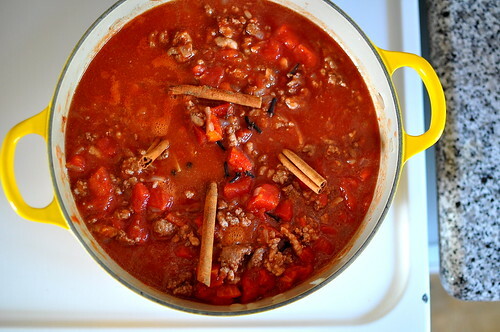 Stir in diced tomatoes and tomato sauce, as well as cinnamon sticks and cloves. Reduce heat to low. Simmer with lid slightly ajar until the sauce is thick, stirring occasionally, about 90 to 120 minutes. 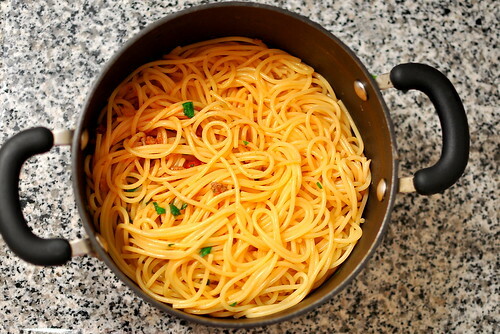 When the sauce is just about ready, cook the pasta in a very large pot of boiling salted water until just tender, but still firm to bite. Drain and return the pasta to the same pot. Stir in a ladle of sauce and swish around, lightly coating the noodles. This will keep the pasta from clumping together and imbues the sauce’s flavors into the starch. 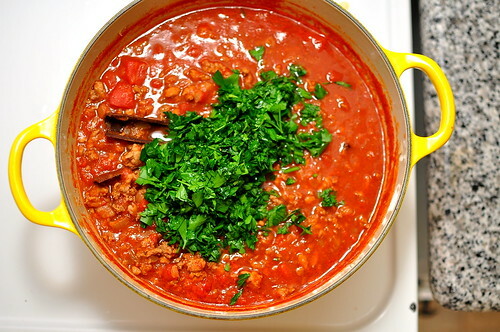 Right before serving, add in fresh parsley to the sauce and incorporate evenly. Season with additional salt if necessary. Serve the bolognese atop warm noodles, along with freshly grated Parmigiano Reggiano. he’s an orator and a cook…what a guy! I am intrigued by the addition of cloves and cinnamon….intrigued in a positive manner as I have added cinnamon sticks to a dish made of tomatoes in the past and it was delicious. What an awesome yellow enameled pot! Oooh YM – blast from the past! I loved that magazine! 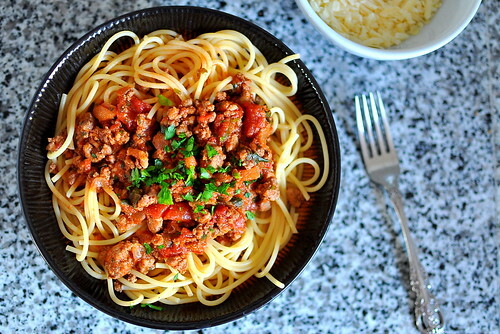 This bolognese looks so hearty and comforting. Great picture, too! I love that there is cinnamon and clove included in this recipe. The sauce is absolutely gorgeous, and I bet the smell – and taste – are intoxicating! Thank you for sharing this recipe. I’ll be bookmarking it to try soon! 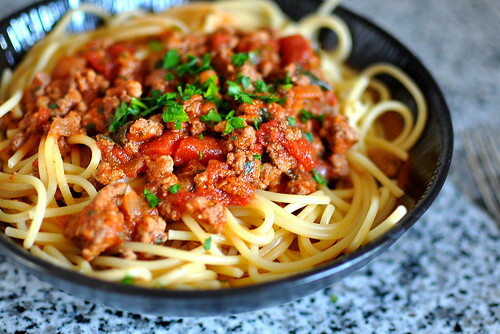 Bolognese happens to be my most favorite food in the whole wide world. I could eat it without pasta. I can’t wait to try this recipe–looks so good and simple. beautiful & simple! Love this sauce!!! this is beautiful. i’ve been looking for a bolognese sauce that comes highly recommended. i like idea of the the addition of cloves and cinnamon. this is a perfect dish for the cooling weather. thanks for sharing! My brother actually used to make my other brother and me spaghetti with meat sauce when he would cook us dinner as youngsters. Nothing as fancy as this, but it always seemed very upscale because he made it. I love the addition of cloves and cinnamon in this sauce — I bet it really develops a wonderful flavor as it simmers. Can’t wait to try! Yhea! This is very Greek byzantium style. We put cinnamon and nutmeg tomato meat sauces all the time. Maybe Anatassia is Greek? lol It’s a Greek name! Either way, I like your stuff here! Anna – Anatassia is Greek! My bro thought she learned this from an Italian boyfriend or something… It could very well be a family recipe 😉 Either way, it’s fab! I’d like to vouch for adding warm spices to meat. I’ve done it with my meat pies (tourtière). It’s also common in Indian cooking. Those spices lend a certain earthiness to the dish. I’m looking forward to trying it with a bolognese! Yum! This is soooo good. I Love a good spaghetti bolgonese. Have you tried using some pommagranite molases. It is my secret ingrediant. In addition to your recipe, I think it would work great. I am going to make this for lunch. Yumm! wow, i need to try this. looks good and i’m always trying to cook up a pot of sauce for work lunches. VERY flattered for posting this recipe! my latest one is to add some spiced sausage – you have to cut it in small pieces tho, the smaller the better! it does make the sauce heavier, but very much worth it as it adds a kick to it! you could also add 4-5 whole black peppercorns to it, together with the cloves and cinnamon sticks. In Bologna, they often add nutmeg to the sauce. So you weren’t straying too far from the original, after all. A couple of things can be changed..
I’d add a touch of apple/white vinegar and Worchestershire sauce. Spiced V8 Juice (a big can), Dattle Pepper Juice/pieces, 1/2 cup of cubed salt pork, chopped Spicy Tomatoes along with a bump of Tobasco. The use of fresh spices is essential and powered spices will not break the bank. Jimmy Dean Italian or Sage Sausage adds great flavor too. I’ve been enjoying this basic recipe (thanks Grandmaw) since the 50’s. The more you make it, the more you end up playing with the mix. I’ve used an almost identical recipe for years, but one warning- if you plan to double this recipe do not add twice the cloves & cinnamon! These spices truly permeate the sauce, so add just a smidge more. Omg, and I forgot the most important part…..add a cup of whole milk with some sea salt to the tomatoe sauce and let it all just simmer for a few hours. Trust me. Just try it! ??? Pingback: Spice Up Your Life: Cinnamon - Noom Inc. | Noom Inc.
My family uses pork chops instead of ground meats. Brown the pork chops in the bottom of the pan that you cook the sauce in then put them in the sauce while cooking.